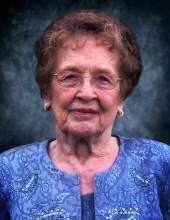 Arlene F. Ross, 93, of Midland, died Wednesday, March 27, 2019 at Stratford Pines. She was born December 26, 1925 in Bay City, daughter of the late Frederick and Mary (French) Kloph. On June 3, 1944, Arlene married John Ross in Midland. He preceded her in death January 27, 1976. She enjoyed car rides and had a tremendous love of animals, especially cats. Arlene had a great sense of humor and loved to tell jokes. She is survived by her children Mary (Jim) Gettel, Karen (Skip) Brousseau, Bob Ross, Rich (Terri) Ross, John (Patti) Ross; daughters-in-law Mary Ross and Sandy Ross; 16 grandchildren; 22 great grandchildren; 6 great-great grandchildren; and her brother Robert Kloph. In addition to her parents and husband, Arlene was preceded in death by her sons Dave Ross and James Ross as well as her sister Joan Eickolt. Funeral services for Arlene will take place at 1 p.m. Saturday, March 30, 2019 from the Ware-Smith-Woolever Funeral Chapel, 1200 West Wheeler Street. Pastor Larry Moe will officiate with burial to follow in Midland Cemetery. Her family will receive friends at the funeral home on Saturday from 11 a.m. until the time of services. Those planning an expression of sympathy are asked to consider the Humane Society of Midland County. To plant a tree in memory of Arlene Ross, please visit our Tribute Store. "Email Address" would like to share the life celebration of Arlene Ross. Click on the "link" to go to share a favorite memory or leave a condolence message for the family.